Jirachi does not evolve/is not evolved into. X Wenn Jirachi erwacht, erfüllt es die Wünsche, die man auf die Zettel an seinem Kopf geschrieben hat. X On raconte qu’à son réveil, il exauce les vœux écrits sur les rubans de papier de sa tête. X Desde antaño se dice que concederá los deseos escritos en las notas de su cabeza cuando se despierte. X Da sempre si dice che al risveglio realizzi i desideri scritti sulle striscioline attaccate in testa. X 깨어났을 때 머리의 종이에 쓴 소원을 이루어준다고 먼 옛날부터 구전되었다. Y Man sagt, es kann alle 1 000 Jahre für eine Woche jeden Wunsch erfüllen. Y On raconte qu’une fois tous les 1 000 ans, il a la capacité d’exaucer tous les vœux durant une semaine. Y Se dice que puede otorgar cualquier deseo durante una semana cada 1000 años. Y Ha l’abilità di realizzare ogni desiderio, ma soltanto per una settimana ogni 1000 anni. Y 1000년 중 7일 동안만 깨어나 모든 소원을 이루어주는 능력을 발휘한다고 한다. Omega Ruby Jirachi will awaken from its sleep of a thousand years if you sing to it in a voice of purity. It is said to make true any wish that people desire. Omega Ruby Jirachi wird aus seinem tausendjährigen Schlaf erwachen, wenn du ihm mit klarer Stimme etwas vorsingst. Es soll angeblich alle Wünsche der Menschen erfüllen. Omega Ruby Jirachi dort depuis mille ans, mais il se réveillera si on lui chante quelque chose avec une voix d’une grande pureté. On raconte qu’il peut exaucer les vœux des gens. Omega Ruby Jirachi despertará de su letargo de miles de años si se le canta con una voz pura. Dicen que este Pokémon hace realidad cualquier deseo que se tenga. Omega Ruby Jirachi può essere destato dal suo sonno millenario cantando con una voce pura e cristallina. Riesce a realizzare ogni desiderio espresso dalle persone. Omega Ruby 밝고 맑은 목소리로 노래를 들려주면 1000년의 잠에서 깨어난다. 사람의 소원을 무엇이든 들어준다고 한다. 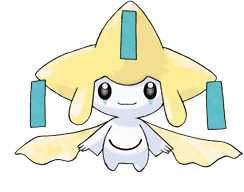 Alpha Sapphire A legend states that Jirachi will make true any wish that is written on notes attached to its head when it awakens. If this Pokémon senses danger, it will fight without awakening. Alpha Sapphire Einer Legende nach erfüllt Jirachi jeden Wunsch, der auf einen Notizzettel an seinem Kopf geschrieben wird. Wenn dieses Pokémon Gefahr wittert, kämpft es bereits, bevor es überhaupt aufgewacht ist. Alpha Sapphire Une légende raconte qu’à son réveil, Jirachi réalise n’importe quel souhait inscrit sur les papiers collés sur sa tête. Si ce Pokémon se sent en danger, il se défend sans même se réveiller. Alpha Sapphire Cuenta la leyenda que Jirachi hará realidad cualquier deseo que se le escriba en las notas que lleva en la cabeza cuando las lea tras salir de su letargo. Si este Pokémon siente peligro, luchará sin haber llegado a despertarse. Alpha Sapphire La leggenda racconta che Jirachi realizza ogni desiderio scritto su bigliettini che trova attaccati alla propria testa, quando si sveglia. In caso di pericolo, lotta senza mai svegliarsi. Alpha Sapphire 깨어났을 때 머리에 있는 종이에 적힌 소원을 이루어준다는 전설을 가졌다. 위험을 느끼면 잠든 채로 싸운다. 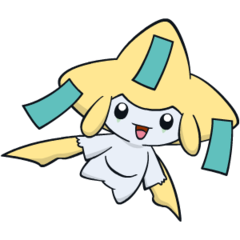 Ruby A legend states that Jirachi will make true any wish that is written on notes attached to its head when it awakens. If this Pokemon senses danger, it will fight without awakening. Sapphire JIRACHI will awaken from its sleep of a thousand years if you sing to it in a voice of purity. It is said to make true any wish that people desire. LeafGreen It is said to make any wish come true. It is awake for only seven days out of a thousand years. Diamond It is said to use its power to fulfill any wish within the 7 days it awakens every 1000 years. Pearl It is said to use its power to fulfill any wish within the 7 days it awakens every 1000 years. Platinum It is said to have the ability to grant any wish for just one week every thousand years. SoulSilver Generations have believed that any wish written on a note on its head will come true when it awakens. Black It is said to have the ability to grant any wish for just one week every thousand years. White It is said to have the ability to grant any wish for just one week every thousand years. White 2 It is said to have the ability to grant any wish for just one week every thousand years.